Smashwords has released their annual ebook survey, and it is quite startling to discover how dominant self-published romance novels have become. 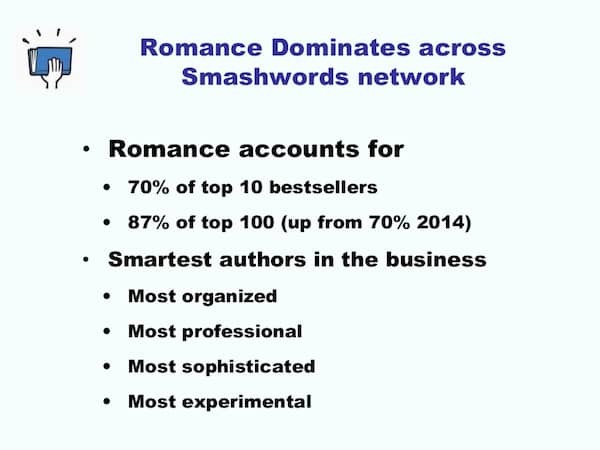 In short, the romance genre accounts for a staggering 87% of the top 100 bestsellers on Smashwords and their aggregators. Should I repeat that number? Eighty-seven percent! While it is impossible to compare this data with sales of self-published romance novels on Amazon Kindle, one could make a logical assumption that romance probably also dominates Kindle ebook sales. However, with such a clear dominance of one genre making up such a massive proportion of ebook sales by Smashwords, where does this leave writers of other genres? This could explain why some authors of genres other than romance, erotica and YA often find it difficult to gain sales traction on Smashwords. 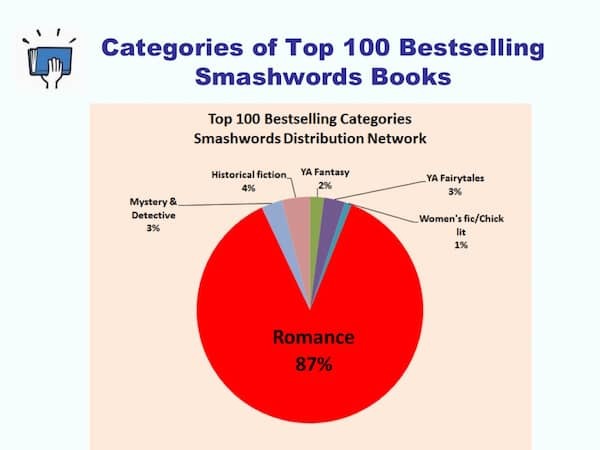 After romance, the top-selling genres are headed by erotica and YA, with Literary fiction just managing to make it into Smashwords’ top fiction genres. Not only are self-published romance novels dominating Smashwords’ sales, they are still increasing in percentage terms. Up from 70% in 2014 to 87% in 2015. The note on the slide below makes for interesting reading, however. The description of the smartest authors in the business may well be true, but it misses one extremely relevant criteria. They must also write romance! It seems to matter little from the data if an author is organised, professional, sophisticated or experimental unless you write romance you have little chance of success. 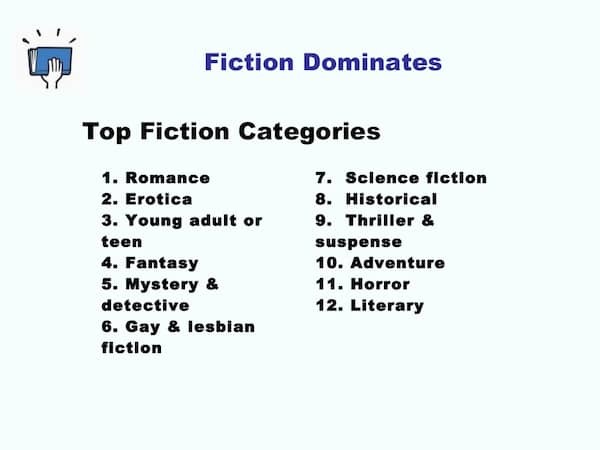 The last slide I have captured is a graphical breakdown of the best-selling genres, which gives more details as to what is selling and also not selling on Smashwords. 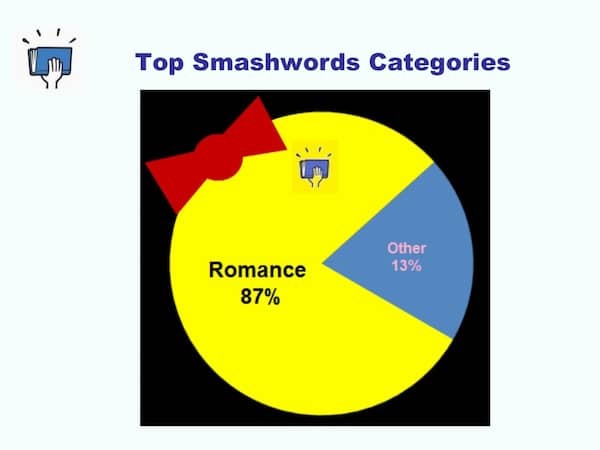 Surprisingly, while romance is so dominant, chick-lit only manages to sneak into the pie chart. If you wish to see all the slides in this Smashwords presentation, you can view them on Slide Share. So what does all this data mean to self-publishing authors? Smashwords have an ebook catalogue of about 400,000 compared to Kindle at around 4 million, so in many respects, it is difficult to compare the two retail platforms. However, from the data they have released, it may explain why many authors struggle to sell ebooks on Smashwords. Simply put, you write in the wrong genre for ebook buyers, who are buying their ebooks from Smashwords and their aggregators, Apple, B&N and Kobo. I know from my own experience that I have never had much success on Smashwords, even though my ebooks sell quite well and steadily on Kindle. Writing self-published romance novels is certainly not my cup of tea, as science fiction farce, speculative fiction and literary fiction are the genres I prefer to write. There is no way in the world I could possibly write romance. So success on Smashwords seems to be, not how well you write, but what you write. I know there has been a lot of discussion about self-publishing on the available platforms to Indie authors, with a range of views about the relative sales success on each platform. There is also, of course, the debate about open publishing and making ebooks available to readers on as many platforms as possible, as opposed to exclusivity on Amazon. However, with this sales data released by Smashwords, it would seem to me that if you are not an author of self-published romance novels, you are probably not having a lot of sales success with Smashwords. But at least you now know why. You may write very well, but not in one of their popular and saleable genres. I’m confident that it’s not the quality of the writing, because the book’s average rating is about 4.5 stars (all but one of those ratings were made by strangers). Pricing also does not seem to be an issue, in my case: a dozen of my paperbacks have sold at twice the price of the e-books. However, I have never done a giveaway. A great many of those “bestseller” e-book romances may have achieved that status because they are either given away or are priced to undersell other genres. If you’re not willing to distribute your work for free, then what matters is who you know. If you have a large number of enthusiastic friends and family members who will buy your work and recommend it to others who trust them, you’ll get sales. If you don’t, you won’t. I fall into the second group: only two people in my family have bought copies (paperbacks) and only one has recommended the book (to two public libraries, which subsequently bought paperbacks). Who you know has nothing to do with “platform,” unless you have a large number of social media-using friends and family who will actively promote for you on your channels and on their own. I do not have such friends and family: only four out of my roughly 400 social media “followers” have bought copies of the book, in either format. Therefore, I believe it’s not what you write, but whether you’re willing to give away your work, and if you know enough people who are opinion leaders who will talk up your writing, no matter what your genre. @Christine, one of the worst things you can do is to ask family and friends to review your book. On Amazon it against their terms and conditions. If they find out (which they seem to be successfully doing in a number of ways), they will remove those reviews. I would look on sites like kboards for ways to promote your books, you can ask for advice on there. There are tons of free and affordable promotion sites you can use like Freebooksy. Check out kindlepreneur, they have a list of promotion sites. Check out Chris Fox, he’s on youtube and has books about publishing. I an only quote what Smashwords reported, Christine. But it goes without saying that many seeming successful authors use a number of marketing techniques. Sure, free ebook giveaways is one, but there is now a renewed campaign of paying for reviews. This I think is playing dirty, but it is a fact of life now, and literally hundreds of paid reviewers are advertising quite openly on social media. With regards to an author platform, I am not sure mere numbers help. I have a large social media following, but that doesn’t equate to book sales. In fact, I sold more when I had a much smaller following. As with all things publishing, it is very hard to know what works, and what doesn’t. But having the right friends always helps. Is New Adult part of the Romance genre? And why do na book covers so often display model-type men with chiseled six packs? Good information for people who may be considering exclusivity on Amazon. I published my romance book which I published in Smashwords in 2014. I sold thousands of copies on Smashwords. It has been on the Romance bestselling list on smashwords and as of this week, it is at the top spot. But this is not just about putting it on Smashwords. To get to that really took a lot of hard work, and promoting the book outside of smashwords, engaging with readers, etc. etc. It is tough to be an indie writer because you do a lot of the legwork for you. To be honest, I do not really feel that Smashwords promotes my work as I have not seen them tweet about it, write about it or Even publish it on their partner sites like Happily Ever After, which publishes Smashwords Romance Bestseller list that is different from what you actually see on the Smashwords bestseller site. What I am saying is that Smashwords will not do the marketing for you, so do not expect your book to sell a lot once you put it there. Smashwords will only distribute your work on their channels. To drive the sales of your book is still up to the author. I point my readers to Smashwords and Kindle by promoting it on third-party sites, doing indie interviews, talking to game developers for story game adaptations, giving away free copies to a chosen few readers, engaging on social media, etc. etc. Giving away free copies or giving access to a free read period on sites like Wattpad is also not a bad thing. My book had 11M Reads on Wattpad before I took it down and published it on Smashwords. And if your readers loved your work, they will still buy the published version even though they have already read it. The trick here is getting your work out there, gaining a following and hopefully a loyal fan-base. Let them sample the merchandise first. And please whatever you do, do not pay for reviews. It will not feel authentic. There are a number of beta readers who will really love your work and will be willing to say it and share their experience.